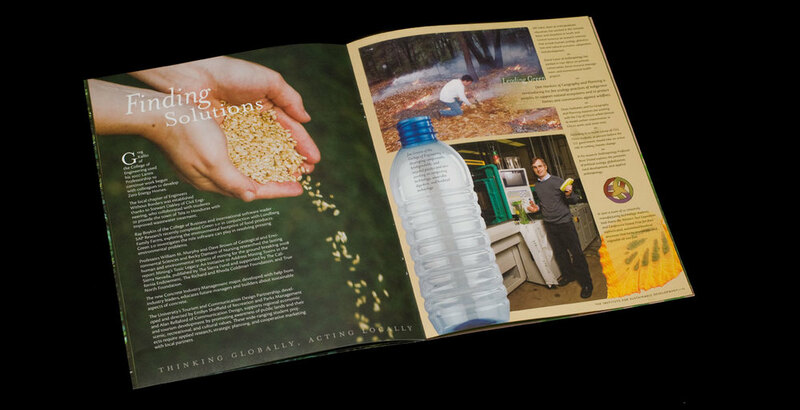 20 page brochure illustrating all the achievements and sustainable practices on campus. Developed a system to incorporate clients’ goals of a photography-heavy finished product and the desire for a text-heavy publication. Colorful nature photography as well as active shots of students, faculty and community members illustrate the compelling actions being taken on campus to preserve the wildlife areas in the area as well as help urban areas grow sustainably. Informal san-serif type is paired with a slightly offbeat serif typeface to keep the feeling light and energetic. Cut-out photography keeps the reader engaged.